Abstract: The ability to detect the carrier-envelope phase evolution of the pulse train emitted by a mode-locked laser has led to the field of femtosecond combs. Femtosecond combs have solved the problem of optical frequency metrology, enabled optical atomic clocks and been essential to the development of attosecond technology. I will give an introduction to the basic concepts of femtosecond combs. I will then discuss the use of quantum interference in a semiconductor to detect the evolution of the carrier-envelope phase, or equivalently the offset frequency of the comb. Following this, I will discuss the quantum limits to the stability of the comb. Biography: Dr. Cundiff is a JILA Fellow; JILA is a joint institute between the National Institute of Standards and Technology (NIST) and the University of Colorado in Boulder, Colorado. 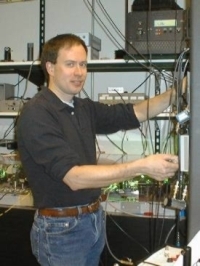 He is also Chief of the NIST Quantum Physics Division and an Adjoint Professor in the Physics and Electrical and Computer Engineering Departments at the University of Colorado. His research includes femtosecond comb technology and ultrafast spectroscopy of semiconductors and dense atomic vapors.